What happens when you reunite two species that have been separated for centuries by human activity? According to our latest research, they might turn out to be old rivals. New Zealand is a pretty unique place when it comes to biodiversity. However, it’s unique in some negative ways too. Thanks to human activity, many of the country’s native species have experienced big reductions in both numbers and the range they occupy. This means that some species in New Zealand that used to encounter one another regularly have been kept apart for hundreds of years by human actions. When we bring species like these back together via conservation translocations, the results can be tough to predict. Kiwi pukupuku/little spotted kiwi (LSK) and tuatara are perfect examples of this. These iconic native species had not encountered each other for around 300 years until they were reunited in Zealandia in 2005. New video footage from an LSK nest in Zealandia shows an apparently aggressive interaction between the two. Perhaps the reunion was not 100% harmonious. Between 2011 and 2013, we were monitoring LSK nests in Zealandia using motion-triggered camera traps. The cameras were there to establish presence of LSK chicks and monitor the outcome of nesting attempts. However, at one nest, we got more than we bargained for. Over 20 minutes in the wee hours of a February morning, we recorded footage of a male LSK and tuatara engaging in aggressive behaviour. This culminated in some dramatic lunging by the tuatara and some ferocious foot-stamping by the LSK. All while the LSK chick hid in the nest. What’s with this clash of the titans? The LSK father in question had chosen to nest in a known tuatara burrow. This burrow had been in regular use by a male tuatara and flagged by Zealandia staff. On this particular night, the tuatara decided there was plenty of space inside the nest for everyone and climbed in. When the male LSK retuned for the evening, he seemed less than impressed with the intruder. He sniffed and probed around the burrow entrance a lot, tried to go in repeatedly, but backed out each time, accompanied by a few aggressive bill snaps. Eventually, the tuatara lunged out of the nest entrance, only to receive a thorough stamping from the kiwi. Seemingly undeterred, the tuatara is later seen back in the LSK nest with the LSK chick behind it. This was worrying for us at the time, as tuatara are known to eat tītī wainui/fairy prion chicks on Takapourewa/Stephen’s Island. An LSK chick could be a handy snack for a large, male tuatara. Fortunately, footage over the following days showed the LSK chick escaped unscathed and eventually fledged the nest successfully. We know from subfossil deposits that both LSK and tuatara had overlapping ranges in New Zealand historically. Thanks to relatively similar diets and habitat preferences (both like to come out at night, both like to eat insects, and both live in burrows), it’s likely they would have encountered each other in the past. However, human activity drove these two ionic species to different island locations and they have been separated for over 300 years. 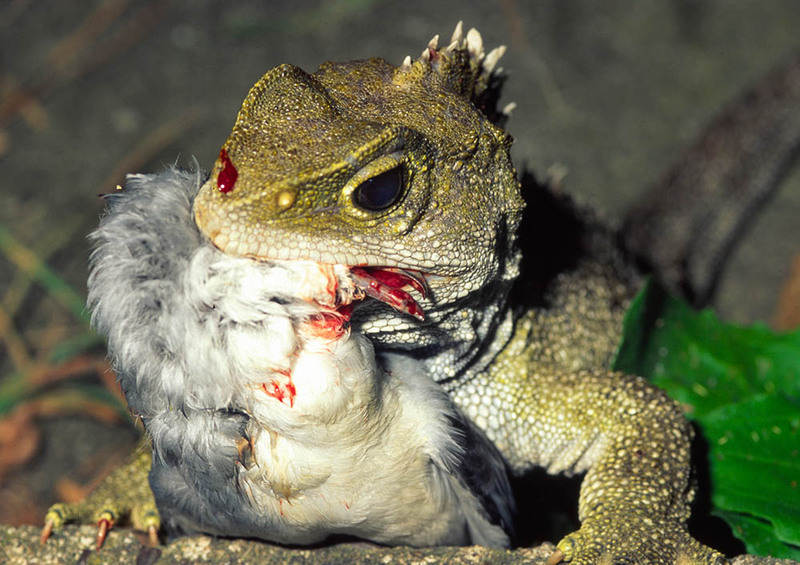 As a result, we don’t know whether aggressive interactions are normal for kiwi and tuatara. We also don’t know how regular such interactions are now that kiwi and tuatara coexist in multiple sites like Zealandia thanks to conservation translocations. Given that this is the only such interaction we captured across two years of camera trapping 16 different LSK nests in Zealandia, it seems like tuatara vs LSK burrow fights are not too big of a deal at the moment. Most tuatara will have a network of burrows they can use if one suddenly becomes occupied by a broody kiwi, so they can avoid this kind of stress. However, as densities of each animal increase, it’s possible that competition for burrows could become more intense. Then, aggressive interactions such as the one witnessed here could become more common. Sometimes we have to keep certain species apart for their own good. 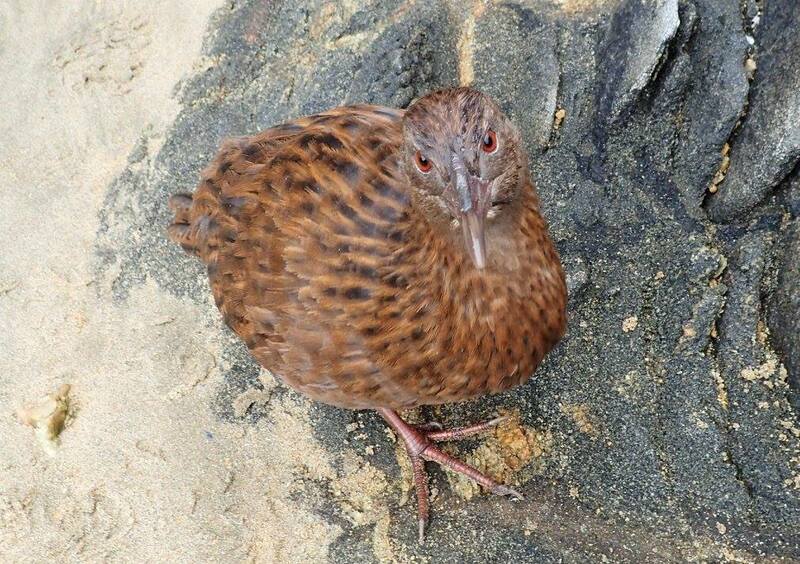 Weka, for example, will take out LSK eggs when they’re on the same islands. Thus, weka are typically removed from LSK sites. Historically, these interactions would have been natural and balanced. While LSK numbers remain low (~1,700), however, we can’t afford to lose birds in this way, even to a fellow native species. Should the same management be applied to kiwi and tuatara? Most likely not at this stage without evidence that tuatara actually pose a threat to kiwi eggs or chicks. The recording does, however, offer a window into the lives and interactions of these two iconic species. What’s more, it suggests we still have more to learn about their natural history. Clearly there is a need to delve further into the relationship between kiwi and tuatara if we want to figure out whether they are friends, foe, or just two species who share a penchant for burrows, bugs, and long walks in the moonlight. This blog is based on a study published in the New Zealand Journal of Ecology. To read the whole study, click here. To watch the full 13-minute video of the interaction rather than the edited version above, click here.